I received the the latest issue of The European Royal History Journal (Issue XCII, Vol. 16.2, April 2013) in the mail today. After a little break from blog writing, the magazine came just when I needed something new to write about. Starting with the front page of issue XCVII, it shows the pretty face of Princess Viktoria Luise of Prussia (1892-1980), the seventh and youngest child of German Emperor Wilhelm II and Empress Auguste Viktoria, and her husband, Prince Ernst August of Hannover, Duke of Braunschweig (1887-1953), son of Crown Prince Ernst August of Hannover (with other titles) and his Danish-born Princess Thyra. The choice of photo on the front page is due to the first article of the issue, titled The Marriage of Princess Viktoria Luise of Pruissa & Prince Ernst August of Hannover and written by QVD author Marlene Eilers-Koenig. The article covers pages 3-15. The author Coryne Hall is responsible for the next three articles. The first two contain reviews of The Prince, The Princess and the Perfect Murder by Andrew Rose (Coronet, 2013, ISBN 978-1444776454) and Die fürstliche Familie von Liechtenstein. Eine Fotoreportage by Uve Harder (Van Eck Verlag, Liechtenstein, 2013) (which I mentioned last month). 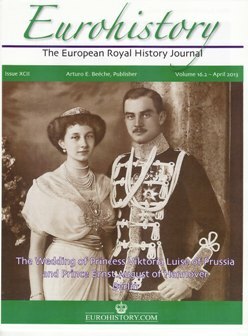 Hall's last article deals with Prince Vsevelod Ioannovich of Russia (1914-1973), son of Prince Ioann Constantinovich and Princess Elena, née Princess of Seria. Paul Brighton then follows up with the article Unto the Fourth Generation. Monarchs with Three Generations of Heirs, before Ilana D. Miller returns with What's In a Photo. A Habsburg Visit to the Court of Madrid 1896. The editor and publisher, Arturo E. Beéche, has written an obituary of Princess Lilian of Sweden, who died on 10 March 2013 and was buried six days later. The magazine also has a Royal News section, which this time includes news from Luxembourg, the Netherlands, Monaco, Saxe-Coburg & Gotha, Sweden, Two Sicilies, the United Kingdom and even the Vatican besides the mediatized dynasties of Croy and Hohenlohe-Bartenstein. The magazine will be a good companion on the metro the next couple of days. 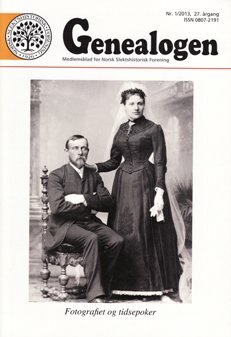 Genealogen ("The Genealogist") is one of two genealogical journals published by Norsk Slektshistorisk Forening (The Norwegian Genealogical Societ, NSF) - the other being Norsk Slektshistorisk Tidsskrift (Journal of Norwegian Genealogy). Genealogen is published twice a year, and the first issue of 2013 reached my mailbox last week. As I am a member of the editiorial committee, where I am first of all responsible for proofreading, the contents are not news to me. I might be a bit subjective, as I am also a board member of the NSF, but I would say the issue has many interesting articles to offer. The front cover shows a wedding photo taken in 1890 by Heinrich Tønnies. The photo also appears in the article Bruden var i sort. Brudebilleder gennem 100 år - en lille guide ("The bride wore black. Bride photos through 100 years - a little guide") by Bente V. Larsen and Tommy P. Christensen. The article was earlier published by the Danish genealogical journal Slægten no. 46 (July 2012), and reappears here as part of an exchange deal with NSF's Danish sister organisation Sammenslutningen af Slægtshistoriske Foreninger - SSF. Ronny Rismyhr Haugen and Trond Bækkevold have authored the article Er mitokondrielle DNA-tester nyttige i slektsgransking ("Are mitochondrial DNA tests useful in genealogical research? ", which is based on an article published in Tjukke Slekta no. 2-3/2013, which I presented in March this year. Torun Sørli has contributed with an article about the missionary Peder Hole (1875-1965) from Brandbu (today in Gran municipality, Oppland), who spent many years in China and was a prisoner of war in Japan, while Ronny Rismyhr Haugen reappears, this time with former chairman of the NSF, Lars Løberg, as author of the article Metodeproblem i norske bondeslekter. Med utgangspunkt i eidsvollmannen Ole Olsen Evenstads nærmeste forfedre ("Methodical problems in Norwegian farming families. With basis in the Eidsvoll man Ole Olsen Evenstad's closest ancestors"). Evenstad was one of 112 men assembled at Eidsvoll in 1814 to draft and sign the Constitution of Norway. The Norwegian Genealogical Society plans to publish the ancestry of all the Eidsvoll men in connection with the Constitution's 200th anniversary in 2014, and the book project is presented in the issue, not for the first time, naturally. I have also made a contribution to the journal, this time a presentation of the book Papal Genealogy. The Families and Descendants of the Popes (Jefferson, NC: McFarland & Company, Inc., 2004. On 11 February 2013 Pope Benedict XVI announced that he was going to step down later the same month. The announcement coincided with a board meeting, where I suggested that the society should buy the said book for its library. The chairman, who also happens to be the editor of Genealogen, agreed on the condition that I wrote a presentation for the newsletter. I stress the word presentation and not book review, as medieval history certainly is not my speciality. The book's main source is the work Famiglie celibri italiane (or Famiglie celibri di Italia), which the Princeton University Library has presented here. The work by Pompeo Litta Biumi (1781-1852) deals with the history of the most prominent (and mainly noble) Italian families. Litta managed to cover 113 of the families before he died, and his work was continued by Federico Oderici, Count Luigi Passerini, Federico Stefani, Francesco de Mauro di Polvica and Costantino Coda. 150 families in all were covered, published in 19 volumes (Princeton University Library says 16) from 1819 to 1883.